Heart Ring Box in Cranberry Ice, Bargain Shack offers Boyd Glass, Mosser Glass, L.G. Wright, and Contemporary Collectible Glass including Vaseline Glass - J.B. Scottie Dogs, Pooche, Animal Covered Nests, Toothpick Holders, Salts, Glass Animal Figurines, Clowns, Dolls, Slippers, Vehicles, and More! 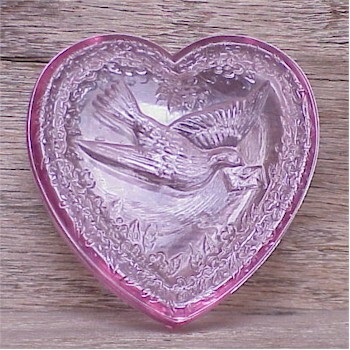 This beautiful Heart Ring Box in Cranberry Ice stands 1-1/2" tall, is 3-1/4" long and 3" wide. The love bird carrying an envelope relief design on the lid is complemented by a floral trim.